Figure A16. 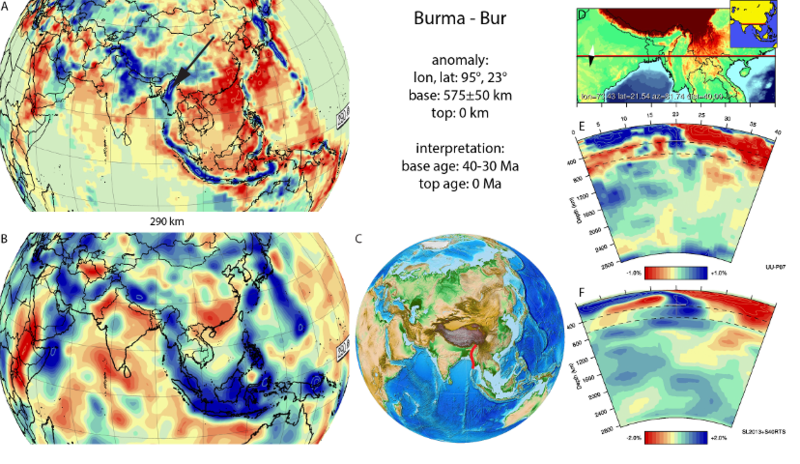 Burma anomaly, interpreted as the Burma slab, with (horizontal) [vertical] cross sections through (A)[D] the UUP07 p-wave) and (B)[D] the combined SL2013 and S40RTS s-wave models at 290 km; C) the location of the modern geological record that we interpret to have formed during the subduction of the slab. A N-S striking, steeply east-dipping anomaly has been described below the West Burma block (Figure A16) by Huang and Zhao (2006), Li et al. (2008), Zhao and Ohtani (2009), Pesicek et al. (2010), Replumaz et al. (2010a), and Koulakov (2011). This was interpreted as a slab that is disconnected in the upper few hundred kilometres of the mantle from the Sunda slab below Sumatra through a slab window below the Andaman Islands. The deepest parts of the Burma slab reach ~710 km depth (Figure A16). The eastward dip of the Burma slab led Li et al. (2008) to interpret the Burma slab as Indian plate lithosphere that subducted below the Burma block. The Burma block in Neogene time has acted as a forearc sliver that moved northward relative to the adjacent Indochina block, bounded in the west by a fold-thrust system (along which the Burma slab subducted), and in the east by a transform fault zone (Morley, 2002; Bertrand and Rangin, 2003; Maurin and Rangin, 2009). The West-Burma block contains Paleozoic and older metasediments which tectonically overlies an ophiolite with upper Cretaceous oceanic crust that in turn was obducted onto India (Acharya and Mitra, 1986). The ophiolite overlies a foreland basin with Cretaceous to Upper Eocene to Lower Oligocene clastic sediments, and is unconformably covered by shallow marine to fluvial Upper Eocene sediments (Ghose et al., 2010), constraining the final obduction onto India to the Late Eocene-Early Oligocene, ~35±5 Ma. By that time, northeastern India was in a postion adjacent to, and underwent highly oblique convergence with the West Burma block. A kinematic restoration of the oblique Burma subduction zone of van Hinsbergen et al. (2011a) suggests that ~600-700 km of E-W convergence occurred between India and the Burma Block since ~30-40 Ma, alongside ~1100 km of northward motion of the Burma block relative to Indochina. This 600-700 km corresponds to the length of the Burma slab and we consequently interpret the base of this slab to have started subduction around 35±5 Ma. We note that the major northward motion of the Burma block relative to Eurasia and Indochina requires that the Burma slab has undergone major slab-parallel motion relative to the mantle, travelling together with India.